In the 2012 Presidential election, Newt Gingrich tried to attack President Obama by tying him to Saul Alinsky, the person who is considered by many to be the father of modern-day community organizing (and who died forty years ago). Ironically, Rudy Guiliani also attacked Gingrich for “acting like Alinsky.” These kinds of attacks continue in the 2016 election. Some readers might not know who Alinsky was, and I thought a quick post might be useful. 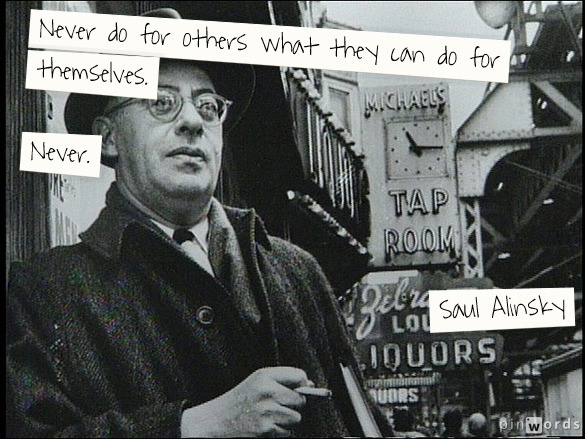 Prior to becoming a teacher, I worked for many years as a community organizer for the organization Alinsky began in the 1930’s and directed until his death. I’ve previously posts a number of links about him in The Art And Value Of Compromise. The National Film Board of Canada did an extraordinary series of films about Alinsky’s work. Newt Gingrich and the Real Saul Alinsky is by Bill Moyers. Who is Saul Alinsky? is also by Bill Moyers. Newt Gingrich is no Saul Alinsky is by Nicholas Von Hoffman. Know Thine Enemy is from The New York Times. Vox has published a lengthy description of Alinsky and his work. In fact, it’s one of the best pieces I’ve seen anywhere about him. Here’s a nice summary of Rules For Radicals. You can learn more about the present work of the organization Alinsky founded here. Saul Alinsky’s 13 Tried-and-True Rules for Creating Meaningful Social Change is from Open Culture. I hope you find these resources clarifying and helpful. PreviousWow, NY Times Editorial Supports “Rethinking Columbus”! 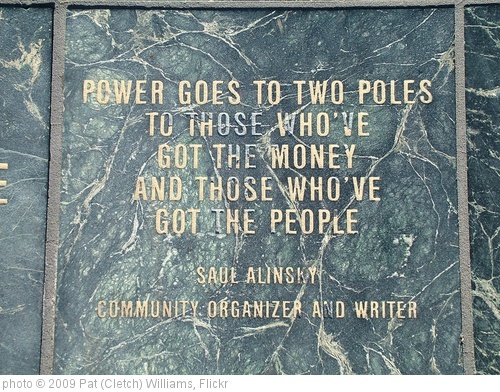 I think Saul Alinsky is now best known as author of Rules for Radicals. Your collection of resources doesn’t make the central fact that people really want to know clear: Alinsky worked hard to achieve socialism in the U.S. He taught others how to do the same, and his methods for doing so is what he’s famous for. His main method was to couch radical sentiments in terms that middle-class people can be comfortable with–to soften such sentiments, and when that is not really possible, then to use vague language and if necessary, untruths. Generally, the idea to sound pragmatic, cerebral, reasonable, and completely moderate–regardless of how radical the goals advocated. The video interview you posted, “Encounter with Alinsky,” illustrates his persona and method perfectly. They never really say what they’re talking about. They speak in code. And half of the time, what they’re talking about is the very tactic of speaking in code, and as necessary, changing the code. Myself, I love clarity, which is why I’ll never get into politics. You’re right about Alinsky being the author of Rules For Radicals. Your other comments about him, however, have no factual basis and are the typical false accusations made against him and other organizers (and former organizers, like President Obama). Just watching this video on Constance Steinkuehler going to DC to design games to improve the world…. At the bottom of the post is an 8 minute video on her views of “interest driven learning”. At about the 4 minute mark she discusses using games to develop readers. At the 7 minute mark she says “teaching would look a lot more like community organizing”. Immediately thought of you! Thanks for all your contibutions.